Q. A. IMP. MIL. NURSING SCE. Her Commonwealth War Graves Commission headstone is located in Grave Plot # 411 (South side of Church) of St. John the Evangelist Churchyard, Sutton Veny, Wiltshire. She was known as Kathleen and Katie as an adult, and this explains why her initial on her gravestone is K.
The 1911 Ireland Census recorded Kathleen Bolger as a 33 year old Hospital Nurse looking after the Roman Catholic Bishop of Dromore - Most Reverend Henry O'Neill (aged 67), Fullerton Road, Newry, County Down. Also listed were 3 servants - Annie Murphy (Housekeeper, aged 52), Maggie Holywood (Housemaid, aged 22) & Sophia Kelly (Hospital Nurse, aged 22). Most Reverend Henry O'Neill was the Roman Catholic Bishop of Dromore from 1901 to 1915. The Newry Cathedral was enlarged and beautified by Bishop Henry O'Neill. She joined the Queen Alexandra's Imperial Military Nursing Service (Reserve) and was given the service number of 2/RES/B/1257. Staff Nurse Katie Bolger died on 5th March, 1916 of pneumonia at Sutton Veny Military Hospital, Wiltshire. A death was registered in the March quarter, 1916 for Kate Bolger, aged 42, in the district of Warminster, Wiltshire. 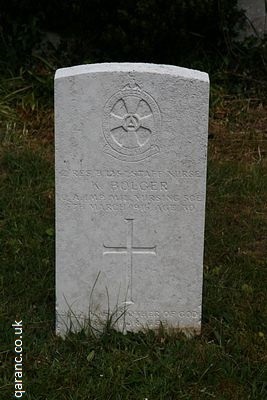 Staff Nurse Katie Bolger was buried on 7th March, 1916 in the Churchyard of St. John the Baptist, Sutton Veny, Wiltshire - Grave Reference 411. South side of Church. The book The Carlow War Dead: A History of the Casualties of the Great War by Tom Burnell has further information about her, and also gives her age as 30 and that she was Interred with Full Honours. Her father received a letter from Father Corcoran which is included in the book. It states that "Katie Bolger came to Suttonveny Military Hospital about four months ago, to take up the duties of Staff Sister, with the military rank of Lieutenant. Her bright and happy disposition soon made her a favourite, not only with the Matron and staff, but particularly with the patients, and her loss is greatly felt by all. She contracted pneumonia only a week ago, and although she received every care and attention, she passed away on Sunday evening last, fortified with all the rites of the Holy Church. As she had expressed a wish to be buried in the local Churchyard, her desire was acceded to. The funeral procession fell in at 10 o'clock, March 7th, in the hospital grounds, to proceed to Suttonveny Church." It continues to describe her funeral procession. She is named on the Roll of Honour Tablet that is beside the Five Sisters Window in York Minster, York, England. More of which can be read on the war graves page along with photos. She is also remembered on the QAIMNS Memorial in St. Anne's Cathedral, Belfast. 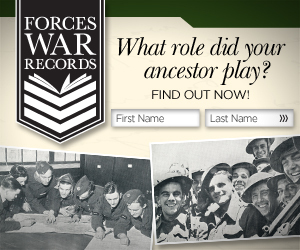 During the two world wars, the United Kingdom became an island fortress used for training troops and launching land, sea and air operations around the globe. There are more than 170,000 Commonwealth war graves in the United Kingdom, many being those of servicemen and women killed on active service, or who later succumbed to wounds. Others died in training accidents, or because of sickness or disease. The graves, many of them privately owned and marked by private memorials, will be found in more than 12,000 cemeteries and churchyards. The 26th Division was concentrated at Sutton Veny in April 1915 and No 1 Australian Command was there from the end of 1916 to October 1919. There was also a hutted military hospital of more than 1200 beds at Sutton Veny for much of the war and No 1 Australian General Hospital was stationed there after the Armistice. Sutton Veny (St John) Churchyard contains 168 First World War burials, 167 of them in a plot at the north west corner of the church. Of these, 143 are Australian. There is only one Second World War burial in the churchyard. With thanks to Cathy Sedgwick, freelance writer from Australia.